Click to launch a PDF. Roots of Change guided the development of the Food Declaration to create healthier U.S. food and agriculture policy, which has been slowly and steadily gaining ground for well over a decade. 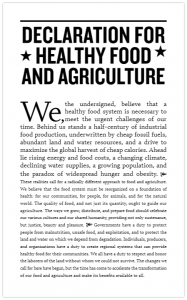 Please click to learn more about the Food Declaration and how it informs ROC’s current policy agenda. Error: Error validating access token: Session has expired on Tuesday, 26-Mar-19 12:54:16 PDT. The current time is Sunday, 21-Apr-19 07:20:00 PDT.